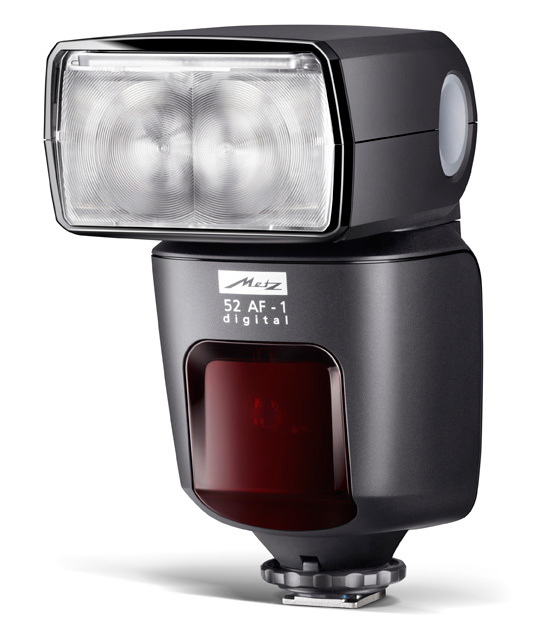 The mecablitz 52 AF-1 digital is the flash product innovation of 2012 from Metz. 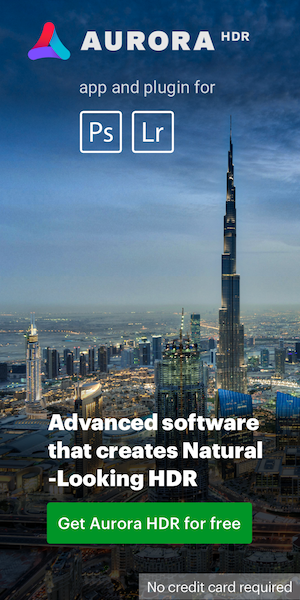 All the benefits of the previous model, mecablitz 50 AF-1 digital, have been retained and numerous further developments have also been added to the new model. The new sophisticated design of the 52 AF-1 housing represents the systematic further development of the 44 AF-1 design family. The guide number has been increased to 52 for ISO 100/21° and 105 mm focal length. The newly developed touchscreen display is, quite simply, the highlight of the 52 AF-1. The 52 AF-1 is the first compact flash unit in the world to be equipped with an illuminated touchscreen display which rotates through 90°. This is particularly practical for operation and taking portrait shots. Like all mecablitz system flash units, the new flash unit is available in different versions and perfectly tailored to digital cameras made by the leading manufacturers. 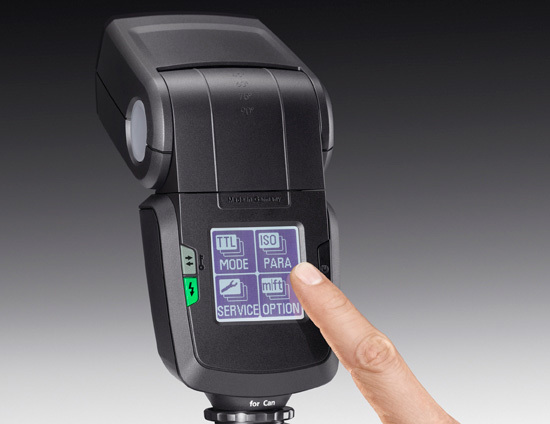 Metz is exhibiting a compact flash unit with integrated touchscreen display for the first time at photokina 2012. It is very easy to operate the 52 AF-1 illuminated graphic display by directly touching the display indicators. For portrait shots, the display thinks with you and rotates the touchscreen display by 90°. That means that the settings can still be optimally identified in this format and the different functions of the mecablitz 52 AF-1 can be practically selected by touching the display. With the new mecablitz 52 AF-1 digital, the options for image composition are almost limitless. It allows precise light output tailored to each individual subject and provides plenty of power for all shooting conditions. Performance and reliability have been further optimised through improvements to the high performance flash tube. Numerous manual fine tuning options extend your creative photographic freedom. Virtually limitless possibilities are opened up for individualised lighting thanks to a fully swivelling reflector system which also contains a flip-out reflector card and a diffuser. As well as the newly integrated master function, a slave function and servo function are also available. These allow the new premium flash unit to be used in different operating modes, depending on the camera model. With the servo flash release, no camera master function is required to use the flash as an additional creative light source in the room. The camera-specific wireless TTL remote mode of the respective models comes into play with the master/slave function. Thanks to the Metz mecablitz 52 AF-1 digital USB interface, updates can be easily installed via the Internet. Due to its high guide number of 52 for ISO 100/21° and 105 mm focal length, the 52 AF-1 digital not only possesses a great deal of power, it also lends itself perfectly to being used for bouncing flash. The real highlight – a flip-out reflector card which is integrated into the both vertically and horizontally tilting and swivelling reflector. The 52 AF-1 has a metal base (not applicable for the Sony model) and can be quickly and conveniently fixed to the camera’s flash shoe. It goes without saying that the respective camera manufacturer’s sophisticated flash lighting technology can also be employed with the appropriate version of the mecablitz 52 AF-1 digital, in addition to numerous other special functions, such as high speed synchronisation. Thus the 52 AF-1 digital offers E-TTL and E-TTL II flash mode for Canon, i-TTL/i-TTL-BL flash mode for Nikon, P-TTL for Pentax, four thirds TTL mode for Olympus/Panasonic/Leica and ADI flash mode for Sony. Metz flash units represent high performance technology and reliable quality. We have been manufacturing in Germany for over 60 years. As such we hold a unique position – Metz is the only manufacturer of camera flash devices to develop and manufacture products in Europe.